Entry : Free (Seating on First-Come First-Served Basis) but Donations are welcome! Salaam Baalak Trust (SBT) is completing 30 yrs of service to street children in Delhi. From 3 staff and 25 children on a balcony of the GRP post at New Delhi Railway station, we have now grown to over 250 staff, providing support services in Delhi & the NCR region through our 23 centres- including 7 shelter homes, and 13 day centres and three Childline (1098). In the year 2017-18, we have been able to touch and care for about 9,000 vulnerable children. To celebrate three decades of care & protection of street children, our children are bringing a dramatical presentation of street life, drawn from their own life experiences. 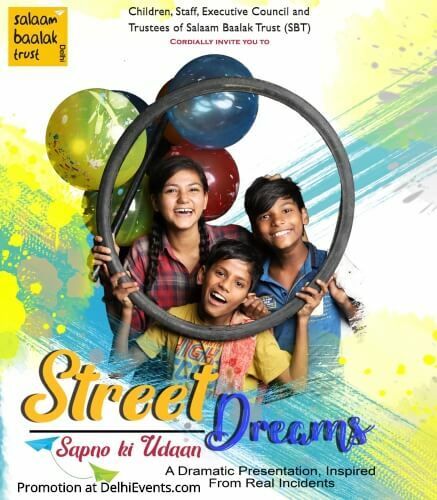 The play ‘Street Dreams’ weaves the story about struggles of three children living on the streets and their determination to transform destiny! Written, directed and enacted by the children and alumni of SBT, the play promises to be an enriching experience. We cordially invite you to please grace the event and encourage the children with your presence.